The high five was invented in Hogansville. That’s a rumor I recently heard. It could be true, who’s to say? Oh yeah, here’s another— the sole of the moon boot, the one that stepped ON THE MOON… that was manufactured in Hogansville. Maybe. US Rubber company? Can you help us out? We’ve been on the ground in Hogansville for two years now. A lot’s changed since the early days. Those days of breathing black soot of dubious origin as we tore out the stained drop ceilings of the old police station. People have come and gone. New faces have been added to the team. The cry of newborn babies has become a familiar backdrop to our team meetings. And the train, it continues to punctuate the days with its thunderous, window rattling cameos. These days the majority of the bustle and hum takes place around the Train Depot. Walking in the iron gates, the first door you’ll enter will bring you to Station Coffeehouse. This was one of our first projects upon opening the doors of the depot nearly six months ago. A specialty coffeehouse serving some of the best espressos and lattes outside of Atlanta? Sure, that belongs in Hogansville. We knew from the outset that for ANY sort of cafe to succeed, it had to have a community focus. It had to be a comfortable place for old friends to catch up over a cup of freshly roasted Guatemalan drip brew. Some of the best coffee drinks you'll have - here in HGVL! It had to be a place where impromptu business meetings could take place; where local government figures could come to shoot campaign videos; where mothers could stop by with their small dogs and fancy strollers for an afternoon pick-me-up. For any of this to work, we needed THE CHAMPION. The person behind the counter that embodied this welcoming, communal, warm atmosphere. Matty Fleuriet was that person. Recently returned from Australia, he took a leap of faith in starting this shop—in Hogansville, remember. Now he lives right across the street with his new wife. We can have the hippest antique train depot out of all the hip antique train depots in the state, but if there isn’t activity, if there isn’t LIFE happening there, then it would just be a pretty facade a visitor flies by on his way to the interstate. So how do we ACTIVATE the depot? The answer we came up with: Market Day Under the Lights. What if we had a monthly gathering where local artists and makers could display their goods? And we’ll also have live music. Food. Games. A relaxed environment where families could hang out, catch up with old friends, sip a good coffee or cold beer, and for a moment, ENJOY their community. So that’s what we did. We put the event on the calendar, stressed ourselves out COMPLETELY too much by trying to get the depot ready, the coffeeshop built out, and the event organized ALL at the same time. At this point, our team has grown. One of the biggest encouragements has been to see others come along and plug-in to what's going on here. At this point we have seen a momentum truly begin to build. OPENING DAY OF THE MARKET UNDER THE LIGHTS. The mayor and council came down for a fancy ribbon-cutting ceremony. Our team breathed a sigh of relief after a couple edgy weeks of late nights laying floors, building tables (who even does that? ), and painting old train cars. Finally, the day was here. We opened the gates. Slowly people began to trickle in. Then lines began to form. Taco man was slammed. People were lining up out the door of the pub, the cafe. Kids were playing ping pong. Old friends were joking over a pint of locally brewed craft beer, watching local musicians play to a crowd of out-of-towners. It was a little slice of community magic happening right there under those hanging lights, at the old train depot. Since that Market Day, we’ve attempted to hold a Market Under the Lights once a month, and it’s continued to grow and evolve! And then, just a few weeks ago, The Great Southern Pub opened for weekly business. In the same way that Station Coffeehouse provides a ‘third space’ during the day for friends, locals, AND out-of-towners to gather and meet – so the Great Southern Pub would provide the communal gathering space during the evenings. We dream of one day having board game nights, workshops, lectures, comedy, live music. A real hub providing a vibrant space for this community to enjoy. 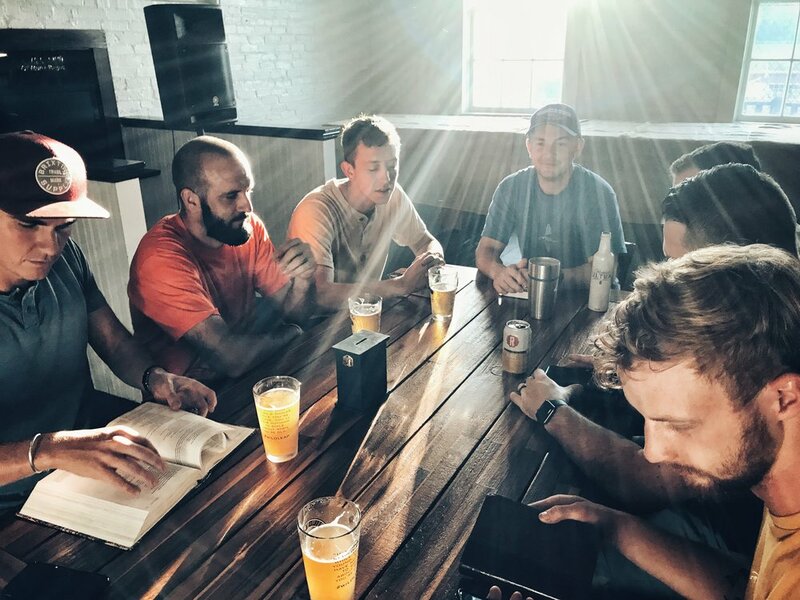 Theology on tap at The Great Southern. Housing is a common roadblock we’re running into. There just isn’t enough. Troup County is one of the most under-housed counties in the country. And it’s only going to get worse. We’re brainstorming a program to go into places such as the village, fix up some of the deteriorating houses there, and make them available as lodging both for singles and new families. Not a week goes by that we don’t get several requests for lodging here in Hogansville. Lofts! What a great investment. If someone came in, bought one of these old brick buildings and put a couple lofts upstairs — those would go like hotcakes! Ok, bear with me. This is a sore point. The other week, I step out the FRONT DOOR of our office and three AT&T employees are running a thick blue cable down into an open manhole. After a brief conversation, it comes to light that they are running FIBER (super fast internet) through this conduit, across the street to a subdivision. Ok great! So downtown is going to get fiber too? I mean, that’s going to do a LOT to attract businesses here, as could be expected. Currently, the fastest internet available downtown IN THE BUSINESS DISTRICT is 18mbs. Which frankly doesn’t cut it for most modern companies. But that’s about to change right? I mean, I can basically reach out the front door of my business and touch a high speed internet cable. The fiber is BYPASSING downtown. All the businesses. All the homes. Why? Not enough roofs. I can drive three miles outside of town and my friend has high-speed fiber internet. But inside town. Zilch. Let's take a step back. We've got a coffeehouse, a pub, a secret game room with all sorts of fun times, we've got new people showing up weekly that want to be part of this project. We've got a local ARTISAN METAL WORKER. Jake's moved his wood shop into this space. Jake and his industrial furniture. We still have trains! How cool would those be for little food stands or studios? Not only for wedding backdrops -- what about putting some shops and studios in there? So all of this...what's it for? Why Hogansville? And this word community — is it just a buzzword? From day one a guiding principle for us was: design a community in which we would want to be a part. A community where new ideas for businesses can be pursued without a crippling large cost-of-living. A place that encourages creative people to meet and discuss new ideas. A community where you can walk and grab groceries, or a coffee. This article highlights how Millenials are beginning to leave the large metropolises and take up residence in small cities. Are we there yet? No. There's still a lot to work on. We need to get better at providing activities for the youth. Main street is still largely vacant buildings owned by one person. There's great programs on the ground already providing services for youth and those struggling to make ends meet — we need to get better at supporting those programs. But change comes in relationships. It comes in the form of young families moving here and not treating the city as a 'commuter home' but actually sticking around on weekends and getting engaged in local activities. It looks like neighbors sitting down over a cup of coffee and planning a fun evening for the local youth. Want your very own HGVL flag to fly proudly? Get it here. Keep up with what's happening in HGVL! A New Artisan Metalworker Has Moved to Hogansville! Join us in welcoming a new neighbor to town—and an exciting business. Eagle River Forge. We were first introduced to Mitch Kernodle at the Hummingbird festival, where he had a booth showcasing some of his artwork. This sparked a conversation that brought us to realize how closely our goals and vision aligned with Mitch's. He has a passion to share the industrial arts with the world. He also has a shared vision for what a small town community like Hogansville can become—in other words, he closely dovetailed with everything we had been working on. This is exactly the kind of operation and artisan we had been searching for. At the time we spoke to him at the Hummingbird Festival, he was actively looking for a larger space to grow his operation. We saw this opportunity and cast the vision of him relocating his forge to our community. Six months later—he just purchased a warehouse near town center. Mitch has grand plans for his new Hogansville shop -- it’s exciting that someone with such a track record has decided to relocate their operation here. We believe this is going to be a huge development for the city, not only in new jobs and learning opportunities, but also by having a renowned artist and craftsman with a studio and shop right here in central Hogansville. METAL FABRICATION SHOP. First and foremost is the breadwinner: metal fabrication. Mitch will immediately need to staff his shop with welders—providing great job opportunities and learning experiences for Hogansville residents. And of course, any business entering our city is a positive development, and something we should support fully. INDUSTRIAL ARTS. Mitch is a skilled creative, with great design chops and an artistic flair. He’s featured his work all over the country. One future project will be to create a showroom for his pieces. Picture this: a unique artist exhibiting his high-quality work in Hogansville. It’s a great addition to our city. APPRENTICESHIP AND LEARNING OPPORTUNITIES. Mitch has a passion for educating this generation in welding and metalwork, trades that are slowly being lost. In the past, he’s been part of makers' spaces where he’s instructed others in the metallurgic arts. He’s looking to bring that focus and energy to Hogansville. How great would it be to expose our youth to the world of metalworking? Welding is a sought after trade, and that’s just one of the skillsets that Eagle River Forge will be instructing and developing in the near future. Look for more to come! PARTNERSHIP WITH LOCAL CRAFTSMEN. As you can see in the photos, this warehouse is a massive space. There’s plenty of opportunity for the growth and expansion of Mitch’s vision and mission. One local business, Arrowhead Trading Company, will be moving its operations into this space as well. Arrowhead Trading Company is a furniture company headed up by our own founder, Jake Ayers. By working in tandem with Eagle River Forge, they’ll develop some truly unique and top-of-the-line metal/lumber industrial style furniture. We can’t wait to see the direction this partnership goes! We hope this is only the beginning of artisans and creatives such as Mitch choosing to locate their headquarters in Hogansville. It’s a town full of opportunity and blank canvases. Welcome to HGVL, Mitch, we eagerly await the projects and creations that will leap from your forge! Mitch will be taking place in our first HGVL Market Day on May 13th. If you want more info, or are interested in becoming a vendor, click here. READ PART ONE OF OUR STORY HERE. READ PART TWO OF OUR STORY HERE. READ ABOUT OUR PLANS FOR THE HISTORIC TRAIN DEPOT. Sign up with your email address to receive news and updates from Pioneer. We’re excited to announce the next stage of the PIONEER PROJECT. The Main Street Market (aka the old Hogansville Train Depot). Papers were just signed, signatures made and handshakes shaken. The depot is now part of the Pioneer Project! The depot is around 115 years old. Tons of history. When it was created, it was the largest station between Atlanta and Montgomery. The original Pioneer, Hogan himself, was responsible for the depot being created. 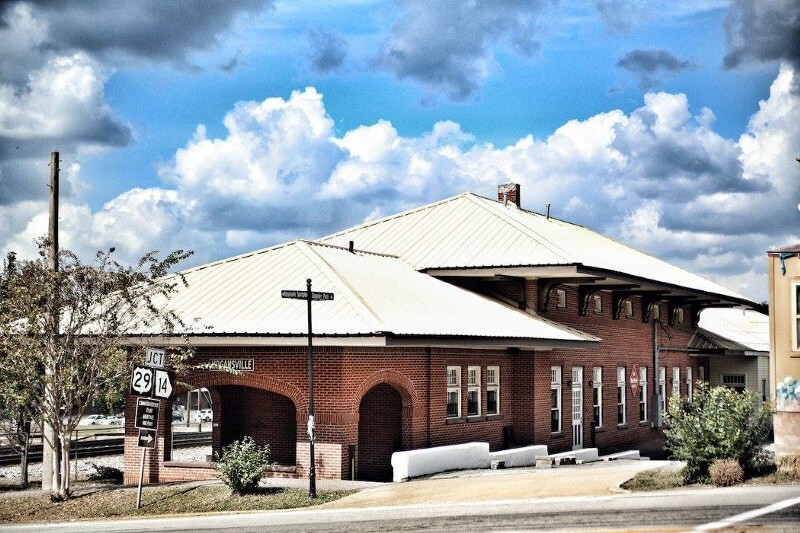 He knew by insisting on a train depot at this stretch of rail, it would create a center of commerce—and that became the town of Hogansville. The exciting thing about the depot is that it holds so many interesting spaces and possibilities. Imagine the depot turning into a Main Street Market. Still imagining? Good, let’s take a walk through what the depot could become. Here we have the alleyway between the depot and this ancient stone wall. This outdoor area could become the perfect setting for a monthly market. Nice Veranda, great spot to sit and sip a latte. Local vendors, fresh produce, cheeses, handcrafted items. This is the place to go if you want to find local goods and highly curated crafts. We have three spacious rooms (that need a paint scheme update). What could these be? How about a cafe in the front room? Big farm style tables. Outdoor seating available under the front pavilion. Excellent local coffee. But isn’t it super hard to operate a successful cafe? Especially in a small town? Yes. That’s why this cafe needs to have several different revenue streams. Breakfast biscuits. Wine and beer in the evenings—with live music. A marketplace that offers a good sampling of local goods. Books. Records. This isn’t just a cafe, but also a center of commerce. Another thing, there is a ton of traffic that passes just a few yards away from this cafe. Highway 29 is a heavily trafficked state route. The center room would be perfect to place a long community table, for social gatherings. A key point to stress here is that the depot won’t be just ONE MODEL. Its success won’t ride on the success of the cafe… or the restaurant, or the events space. It will be a series of businesses, ideas, partnerships. As traffic grows for one business, it helps all the businesses out. Rising tides lift all ships. Continuing into the space we have THE PUB. Look at this place. It exudes character. The last thing we would want in here is a sports bar type atmosphere—loud TVs, blaring music. We want a true Irish Pub feel. The kind of place people feel comfortable stopping by and talking about the latest news about town. Here’s an authentic Irish Pub. Tons of history and texture. A true communtiy gathering point. Moving on, we come to the faux train car. This could serve as a bazaar, indoor display case or seating for additional diners or the restaurant. Turning left, we come to the MAIN DINING ROOM. Eventually, someone will come in and operate some sort of very special, very unique restaurant out of the full-size commercial kitchen. Imagine quality, unique food being served in this space. It would be a draw for miles around, as this is the only depot of its kind in the region, serving great food in a comfortable atmosphere. After dinner, take a walk through the marketplace. Until then, the events that could be hosted here would be one-of-a-kind. You’ve got the patina of an 116-year-old train depot, combined with a charming bar and all sorts of photogenic little nooks and corners. Stairs (on left) lead up to the loft. Up the stairs past the pub. There’s a really great loft space—still unfinished. This can either become lodging or an artist’s loft. Painters, potters, and sculptors can work out of this hidden area—but with handy access to the cafe and pub. Multi-use artist space in the loft. Moving outside, we have… the train cars. The green ones are pre-WWI (1914) and the silver ones are from the 1940s. The imagination can run wild with ideas for what can be done in a train car. Instead of a food truck, how about a food train? The truth is, these railcars will require an enormous amount of work to renovate, so we’re looking for people to partner with to make these rail cars into something special. If you’ve always dreamed of living, working, or eating out of a railcar, let us know! Past the train cars, there are several acres that can be used as a city garden or even a community of tiny homes made from shipping containers. These small, energy efficient and affordable dwelling spaces will be perfect for artists-in-residence. BUT, we can’t do it alone. The secret to this becoming a success is many people plugging in their diverse dreams and passions into the space. With a spirit of collaboration, this could be an exciting community center full of art, creativity, commerce, and hospitality. This could be something unique, something Hogansville could be proud to call its own. If you have any interest in getting involved on the ground floor of this project, shoot us an email. Sign up for our email list so you can news of the next steps. Stay up to date with the latest developments and events at Pioneer and Main Street Market. We’d like to congratulate one of our Pioneer members: Caitlin Crane. Caitlin runs a non-profit called just1. It’s a world-changing operation — they raise money to build safe houses that provide shelter for girls escaping from human trafficking. To hear some of the stories of these trafficked girls, and the way one of these shelters and just a little bit of help can turn their lives around—it's really inspiring! It’s truly a great thing that we have people out there like Caitlin. People that see a worthwhile challenge, and charge full steam ahead, changing lives in the process. So Caitlin had the opportunity to raise TWENTY THOUSAND dollars and have that MATCHED by a private donor. That FORTY THOUSAND DOLLARS would effectively pay for MOST of a shelter in Kenya. Again, these buildings provide an escape for dozens of girls. That’s hard for our minds to fathom. One of these shelters can conceivably save the life of someone. Dozens of someones. Let that sink in. That’s real impact. Caitlin had her work cut out for her, and it was inspiring to watch as she plugged away at it, day after day, climbing this huge mountain of fundraising. Well… just a few days ago she announced: all twenty thousand dollars was raised, meaning a donation of FORTY THOUSAND dollars to building a shelter in Kenya. Absolutely inspiring Caitlin. Way to go! For PART ONE of the story go here. For PART TWO go here. It’s gotten some traction, in the internet sense of the word, lots of views. Our first project was establishing an HQ in Hogansville. And our new HQ was once an old HQ -- an old police station. First came the process of tearing down perfectly good sheetrock walls to expose dirty old bricks, and ripping down the drop ceilings that have become emblematic of cubicle farms and Office Space. We created a lot of dust. And trash. We attacked the plaster walls with sledge hammers and cut out the old pine studs and slashed insulation and tore hideous old laminate flooring up and threw it into a dumpster. It was fun — for the first few minutes. And then it became a giant mountain of work. A huge part of the team was Brett, a local contractor. In between his rabbit hunts, his creativity and craftsmanship really added a lot to the project. People passing by could peek in the windows and see what had to appear like backward process. During the long journey of rehabbing the police station, we gleaned interesting historical nuggets about the building's past. The upstairs was once the seat of the city leadership. There was a huge vault where the records were kept. There was a mysterious concrete cistern that had a foot of dirt on top of it, rumors were whispered that bodies were buried there. And of course, there were the jails. No response. The other worker shakes his head. The other worker nodded. Suspicious. I nodded too. It was suspicious. So, we had a room full of rusty jail cells, covered in junk, old latrines and a horrible odor that seeped out of every hole in the floor. What would we do with this area? We'd make it into office space! Working in an old jail cell. As the dust began to settle, a few local citizens began to drop by and leave some encouraging words. A new day for Hogansville? Summer comes around and we plant a community garden. A local gentleman on a second-hand bike stops by periodically and plunders the tomatoes - in a very civil way. One day, as we walk back to the station from the pharmacy below, we see him toting a bag of vegetables. He thanks us for his haul. “BUT... I may not make it down the hill alive.” He notifies us. Alarmed I glance down at his brakes -- they’ve been jerry rigged with a couple rusty bolts. Indeed, his life was in danger — a train was coming and he had to go NOW. He pushes forward and careens across the railroad tracks rattles off — into sector four. Sector four is the area across the tracks from the depot. One night a car emerges from sector four, tears through the yard of the station, over our blueberry bushes and is deserted on the sidewalk next to the building. The cops immediately know the perpetrator from the make of his auto and send a squad car to retrieve the marauding driver. He’s a local no-do-gooder they say, and they finally have something to pin on him - criminal trespassing. Another day in Hogansville. All this to say, by situating ourselves in this old police station sitting on the corner of main street, we’ve really plugged ourselves into the narrative of this town. The tides, the comings and goings, the endless minor and major scandals, the impassioned sermons from the local Greek restaurant owner. Adding to this, the local government has been encouraging. It'd be easy to think this wouldn't be the case, but several representatives have stated that our vision closely aligns with theirs. That's a good thing. So you’re probably wondering — What is the idea with the police station? Right now it’s operating as a cowork space. A creative incubator. But instead of toiling away alone in our respective bedrooms, or garages, we can come in and work around other young entrepreneurs. It’s the co-workspace model. Working in the cowork space. Strange place to put a cowork space right? Well, yes. But, if we're already here, why not try to encourage others to come work out of this space as well? By now we have a name for our project: PIONEER. Pioneers, those people that loaded into wagons, horses, piled all their stuff into a crude gas-powered automobile and set off for the unknown. Exploring new frontiers and in doing so — sparking new communities across the face of the earth. As more people come and visit, the same suggestion keeps coming up -- WE NEED A CAFE! Somewhere people can go, meet with someone, plugin with a laptop and a coldbrew blend, a third place. Let me tell you about Hogansville's biggest nemesis. The CSX train. Now, there's nothing wrong with trains — trains mind their own business, hauling cargo across the nation, helping the economy. The problem is when a train passes through the center of your city; and blows a horn loud enough to make eardrums shatter, false teeth splinter, and, I kid you not, pictures fall off walls. These aren't the cute little horn blasts of Thomas the Steam Engine. These are dissonant roars that are loud enough to instantly put a person in a bad mood. Dogs seek shelter when a train is on the horizon. They know what's coming. And these trains roll through town as often as twenty times a day. There's a law in effect that could help: a town can request quiet zones to be put in. Quiet zones are special railroad crossings that require the train to NOT blow it's horn-of-despair. But those are too expensive for a cash strapped town like Hogansville. So, until something can be figured out, the citizens of this small town will live life without something that should be a BASIC HUMAN RIGHT -- the absence of round-the-clock deafening noise. Find out what's going on at Pioneer! The young and educated populations have been leaving suburbia and rural America for a generation. In its wake, this exodus has left a countryside full of small town’s either dying or already abandoned. By small towns, I’m talking about the forgotten, idyllic main streets of Norman Rockwell paintings. As everything is cyclical, my theory is that the next explosion in population growth won’t happen in the megacities of the US (NYC, Chicago, San Francisco) but in small and medium-sized towns across the country. First, we have to look at why people leave small towns in the first place. Our test model for this theory will be Hogansville. The Grand Hotel at the turn of the century. Hogansville is a town founded in the 1800s. It went through a boom when the railroad came through, as people from Atlanta would escape the city and come here to enjoy the scenery. Later it became a factory town, supported by a large textile mill looming over the city center. In the 1990s it was fully rented, mainly by antique stores and a few restaurants. Today it sits mainly vacant. There are few establishments on the Main Street that can really be considered successful at this point. So, how can we turn this around? Georgia did $6 Billion in film business last year. It’s a booming industry in this state because of the tax benefits productions receive and the diverse locations and scenery this state offers. Form a film liaison. Hogansville has a picturesque, idyllic main street. The city should follow in the footsteps of other nearby small towns and reach out to production location scouts and present a package for film shooting. This package should detail the ability to shut down the main street section for 12 hours, easy access from the interstate, a local crew of qualified grips, electricians etc… Once Hogansville lands a few film cameos, the demand for its unique setting would rise. In-town production house. This would be an anchor tenant. A production house would specialize in pre-production (writing, location scouting for the area, casting) to post-production (sound editing, special effects work.) Granted, this would take a big effort to recruit the top talent to a small town, but there’s a rising population of young professionals looking to start a family and they want out of the big city and the big city prices. They want to leave behind hours of traffic every day and want to take a walk with their kids to the local community garden (see below). They don’t want to be expected to pull all-night shifts every week. They want the small town rhythm and community. The thought of a successful production house operating in a small town isn’t as far-fetched as one might think. As long as there’s reliable, high bandwidth internet (which is discussed below) a lot of the post-production tasks can be handled remotely. A Film School aimed at low-income and unprivileged youth. Film is a language that brings everyone together, and a small school could be formed that would teach the area youth the basics of filmmaking: screenwriting, composition, editing, etc… This school could be staffed by volunteers from the above-mentioned production company. A good model is the Georgia Film Academy that is opening up near Pinewood Studios. With today’s technology, it doesn’t cost an unrealistic amount to purchase the basic equipment for filmmaking. Cowork spaces are exploding in a global way. What is attractive about them? Why do people want to leave the comfort and freedom of their own home or controlled office environment? As jobs become more remote, a lot of the serendipitous encounters that lead to new ventures are being reduced. This is solved by working in the same physical location as other likeminded and enthusiastic people. You could be taking a coffee break and run into the graphic designer for your new app idea, you could be eating lunch and discussing your business idea with an area entrepreneur. Why do cowork spaces only have to be centered around laptop based professions? As today’s young people spend more and more time at a desk behind a computer, they miss the fulfilling experience of creating and crafting with their hands. So by housing professionals who are physical-craftsmen and professionals that are digital-craftsmen in the same location, you’ll experience even more cross-pollination of ideas and talents than a strictly laptop based cowork space could ever provide. It would be a groundbreaking model that most young professionals would be eager to join. Using the same location as the cowork space, we would provide apprenticeship opportunities for the local youth. While the typical graduate from a four-year private college in 2014 left campus with a debt load of $31,000 and started work earning about $45,000 a year, Apprentice School students emerge debt free and can make nearly $10,000 more in their first job. Apprenticeship has been called the solution to the shrinking middle class of America. Instead of pushing all youth to enroll in four-year degrees, give them the option of apprenticing with a true craftsman. Create a roster of digital and physical artists that are willing to take on and mentor a couple young people in the some of the lost arts of handcrafted goods and the cutting edge fields of programming and digital design. Bring a successful small business into town. In this case, we have a pizza place a few miles away that has quite the foot traffic and a growing following. Why don’t we make it really attractive for this business to move downtown? That would immediately bring this pizza restaurant’s built-in clientele to the main street area. Right now the pizza place only serves dinner. We could encourage them to do lunch as well, improving the midday foot traffic. This would be step one. Get at least one establishment that’s attracting some daily foot traffic. Gigabit internet is all the rage these days. Atlanta is getting it. Every day a new small town pops up that has released their own community gigabit internet. It’s revitalizing small cities across the nation. High bandwidth internet is attractive to entrepreneurs and businesses that work with media. It’s attractive to startups. It’s attractive to upcoming business models such as telemedicine. High speed internet coworker space? If Hogansville had gigabit internet, attractively priced, they could rent out some of the large storefronts to startups, or even better, set up a city managed cowork space and rent office space by the month. That’s recurring revenue coming into the city. There’s been a couple of second floors in Hogansville renovated into stylish, modern lofts. These would make the town even more attractive to an internet based startup. What kind of business makes sense in Hogansville at this point? Not really a business based on foot traffic. But what about those Etsy type shops that only have a storefront for minor transactions? They do the majority of their business online and ship their products out. That would be the perfect setup for Hogansville. Reduce risk of Pop-Up shops. A big concern for many of these businesses is that they feel they are too small to foot the bill of a build-out and monthly lease. They need to save that money for photography and marketing. They’ll continue operating from home, even if they’re outgrowing the space. What if Hogansville had a business bureau that mentored new businesses through the growth stage into a brick and mortar establishment? A business comes into a store that is 90% built out. They only need to add decorating touches. No long term leases the first year. Month by month until they get their feet under them — provide a runway for young businesses. Hogansville has a contracted photographer that is able to give the business a good rate on product photos. There is a local web designer that sets the business up with an affordable web page and marketing campaign. Basically, the city is offering a turnkey solution for businesses looking to get out of garages and into storefronts, without the risk. Hogansville has one of the more iconic old cinemas in the Southeast. Sadly, it’s now being used as a city hall. Renovate this. Start showing films, both new releases and well curated older films. Partner with the pizza place to offer a meal before the film for a package price. This will start bringing in clientele from nearby cities looking for a unique, family-friendly evening out. This is the theater back in Hogansville’s heyday. For the size of Hogansville, it has a HUGE amount of parking. Parking is considered UNUSABLE space in city planning. Huge amount of unneeded parking on main street. What does unusable space mean? Parking can’t be used for walking, for dining, for sitting or shopping. It’s just there as an eye sore. In the above google map, the red is all parking space. Does Hogansville really need so much? What if we take over some of the main street parking? Hogansville has enough parking behind the main strip to eliminate some of the parking on Main Street. Even if this stretch of parking was eliminated, there would be PLENTY of parking behind the buildings. Turn this parking into usable area. Planters, benches, cafe dining. European style, wide sidewalks -- community space. Not a thoroughfare for log trucks. Instead of a wide strip of asphalt running down the city center, we would have a European style, pedestrian friendly area that would be enjoyable to spend time in. Also, the decreased width of the street would make it far easier to cross and increase the amount of store fronts the average pedestrian could visit. A key element most young families are looking at when considering an area to live is schooling. They want their child to have the best education possible. Sadly, rural America is falling well behind most of the world in this regard. The public school system has a myriad of problems, but with technology, there are some exciting new advancements in the education realm. There are some developing models of small classroom style schools where the students have a course load custom fitted to their learning style. Look at startups such as AltSchool. Such a model would be exciting to offer the local population of Hogansville, who feel the public school is not offering the education their kids deserve. Elon Musk’s brother, Kimbal Musk, is spearheading an effort in the US to educate the public on healthy eating. Nothing more needs to be said about the obesity epidemic, which is hitting rural America the worst. A big part of changing this is learning how to grow your own food, and what makes a meal healthy or unhealthy. A healthy meal doesn’t always have to cost twice the amount of cheap carbs from a fast food place. The idea of a community garden isn’t new, but if this garden partnered with a local restaurant that served healthy, affordable meals with the vegetables that this garden(and other local farmers) produced — that would create a model where one would be excited about eating in a wholesome way. Could a restaurant like this break even in a place where healthy eating isn’t the norm? It’s a challenge. But if the food is well priced and tasty, it stands a good chance of attracting a loyal following. As the population expands, the city will be able to support some interesting models downtown. One of the reasons people enjoy living in the city is walkability. They can walk to the grocer, the pharmacy, the park. The city should aim to attract a downtown market for those living nearby. It’s a difficult business to make a profit, but the city could make permissions for them to have a longer runway before break-even (discounted utilities, taxes, etc…) The added benefit of having such businesses downtown would pay for itself. When I first discovered in the early 1980s the Italian espresso bars in my trip to Italy, the vision was to re-create that for America — a third place that had not existed before. Starbucks re-created that in America in our own image; a place to go other than home or work. A cafe/bookstore. A place for people to gather and share. A community place. This magnificent building is begging for an interesting model. A school? A center for workshops? Something big could happen here. The grand hotel has nine rooms, two kitchens, a garden and beautiful common spaces. Right now, a large part of the population that lives in Hogansville commutes to Atlanta for work. Even though a rail line passes right through the city, there is no passenger rail into the heart of Atlanta proper. What about this idea: A comfortable commuter bus with several daily trips to Atlanta and back. This would be a comfy ride, and until the passenger load picks up, it could also stop in some cities to the north to supplement volume. How nice would it be to walk to the station, step onto a bus with comfy seats, WIFI, small desks for working and refreshments while you’re driven the 50 minutes to downtown Atlanta? The city of Hogansville could run this system and with a simple site and app setup you could sign up for a monthly service or daily rides. CONCLUSION AND WHERE WE ARE. We’ve just launched stage one under the heading of Pioneer. This is our creative space and business incubator. This is a space where we’re intentionally cultivating a community of leaders, thinkers and doers that can reach their potential, and in the process revitalize one of America’s forgotten towns. These days community doesn’t happen naturally, but everyone is naturally desperate for it. True community happens when people realize that life is about how we contribute to one another.